Here you can see five of my lilies blooming [from left to right: Chromatella (yellow), Comanche (orange/yellow), Fabiola (pink), Albata (white), and William Falconer (red)], non- blooming lotus (Perry's Giant Sunburst, yellow), some yellow snowflake, salvinia in the net at the bottom left, and a lot of marginals; taken July 1998. Other pictures with my pond plants can be found at my pond pictures page. This is specifically about pond plants. A little bit of information on aquarium plants can be found at my aquarium plant page. Be sure to visit all 33 plant-related pages! 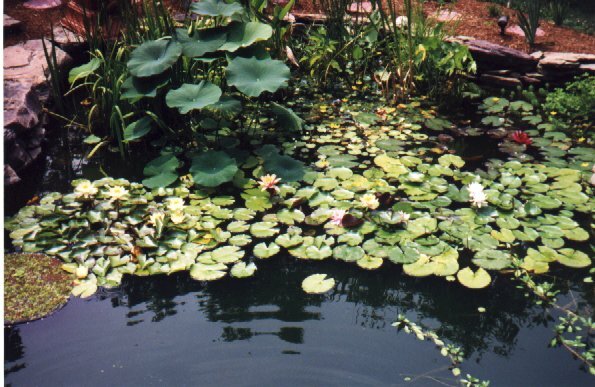 Aquatic Plant List - this is a list on the Organic Gardening site that I wrote in conjunction with an article I wrote for them. Overwintering Lotus - in one of my newsletters under "Pond Tidbits" someone shares how she overwintered some lotus tubers indoors.